Friends of the Island Fox: A Radio Collar for Tani, the Island Fox! A Radio Collar for Tani, the Island Fox! Across the Channel Islands young island foxes are striking out on their own. They have spent the summer playing with their siblings and growing up. Their parents have taught them to hunt and find native fruit. Island fox food. Now, it is time for them to search out their own territory. When Tani received medical treatment she also was fitted with a radio collar to track her movements. The radio collar will provide information on how far she travels from her parents home range and enable biologists to understand where a young fox establishes its own territory. Across the islands young island foxes face challenges surviving without their parents. 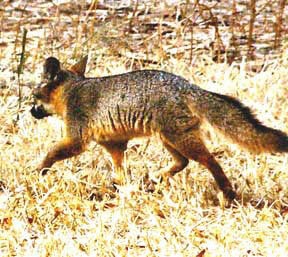 In the past two months several young island foxes have been hit by cars on Santa Catalina Island. Territory along roads can be attractive, but inexperienced youngsters don't know how to avoid cars. Support Watch for Foxes Signs. This autumn Friends of the Island Fox funded our 72nd radio collar to track island foxes on the Channel Islands. Radio collars provide information on island fox movements and also alert biologists when an island fox has died. If the animal stops moving for a 6-8 hours, the collar gives off a special mortality signal. 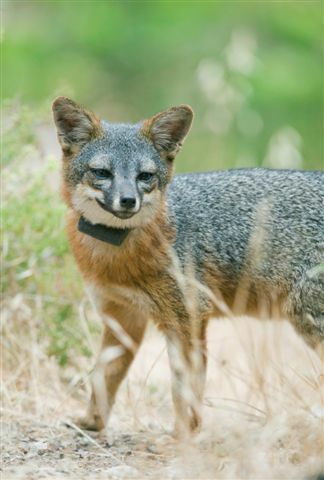 With the aid of the radio collar, biologists can locate the island fox's body and determine if the animals death marks a potential threat to other island foxes. Response to introduced disease and unexpected predation by golden eagles can happen rapidly when biologists have specific information from animals in the field. Radio collars on island foxes have helped the endangered populations on San Miguel, Santa Rosa, Santa Cruz and Santa Catalina Islands to make unprecedented recoveries. Tani is wearing her new radio collar and hopefully it will help biologists track her recovery and her activities as she becomes an adult island fox and establishes her own territory. Follow Tani on Facebook and on Twitter.